The JLO's collection of surgical videos is regularly updated with new content. Please check the Vimeo channel or this site for access. The production of these videos has been kindly sponsored by Karl Storz UK. The JLO's archive of videos has been made available on its own Vimeo channel. Be the first to know about the latest FirstView articles and news about the journal by following us on Twitter. The JLO Web Site can help you publicise your meetings and courses for free. The events pages on this web site have a wide ranging and international list of ENT events taking place. They are a great place to find out about forthcoming meetings as well as for you to publicise your own events. For further information click on the image above. 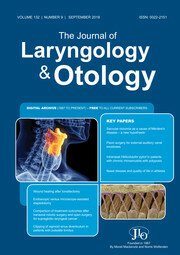 The Journal of Laryngology and Otology is pleased to announce the publication of the 5th edition of the UK Multidisciplinary Head and Neck Guidelines. The Guidelines form one supplement to the journal and are available as Open Access articles on the Cambridge Journals Online website here. The JLO Surgical Video collection is now available on this web site here, and on the Vimeo channel here. The latest videos include External Septorhinoplasty and both Stages 1 and 2 of Nasal Tip Reconstruction by Prof Tim Woolford of Manchester. Please use our online program to upload your articles for submission. We pride ourselves on being able to provide you with a decision quicker than most medical journals. To ensure that your article is not rejected immediately, please read and follow the author guidance. The resource library contains videos of the best paper presentations, invited experts and JLO Visiting Professor series of lectures. This resource will continually be updated, so check for updates regularly. This course is designed to facilitate the trainee surgeon with didactic and hands on cadaveric training experience. The June 2018 issue of the Journal of Laryngology and Otology (Volume 132, Issue 6) is now available online at the Cambridge Core web site. The articles in this edition are the first with our new layout. Please keep an eye out for your print copy. The May 2018 issue of the Journal of Laryngology and Otology (Volume 132, Issue 5) is now available online at the Cambridge Core web site. Please watch out for your print copy in the post. The April 2018 issue of the Journal of Laryngology and Otology (Volume 132, Issue 4) is now available online at the Cambridge Core web site. Please watch out for the print copy in your library. The March 2018 issue of the Journal of Laryngology and Otology (Volume 132, Issue 3) is now available online at the Cambridge Core web site. Please watch out for the print copy in your library. The February 2018 issue of the Journal of Laryngology and Otology (Volume 132, Issue 2) is now available online at the Cambridge Core web site. Please watch out for the print copy in your library. The editors of the JLO are pleased to announce the selected best papers from 2017, which will be presented at the Study Day in May.